There was always something magical and adventurous about purchasing an import album when I was a kid. They cost more. They came in loose fitting mylar bags instead of being shrink-wrapped tightly in plastic. Unlike their American counterparts, the sleeves were flexible and shiny instead of dull, rigid cardboard. They even smelled different — like they'd travelled from somewhere far away and exotic. 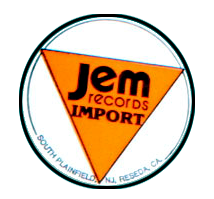 Many of the bands on import records had strange, foreign names like Clearlight Symphony, Amon Duul, Nektar and Ash Ra Temple. Some had names as ordinary as Can. Most of them were only played very late at night, flittering in and out of tune on the lower end of the FM wavelength. Programs like Fresh Air that emanated from Kent State University's radio station actually showcased bands like Van der Graaf Generator, Gentle Giant and Gong. The dj's voice was barely a whisper over the late-night air-waves as they extolled the virtues of mellotrons, jazz-rock fusion and the romantic poetry of Keats. Lots of import records only contained a pair of songs: one on side one and one on side two. It was music that seemed to defy the definitions and boundaries of rock n' roll as I had come to understand them. It was music that broke a lot of rules and then simply made up its own. It was music that sent me searching in a number of directions I had never ventured before — sometimes these musical excursions resulted in frustrating dead-ends: tunes and concepts I just could not wrap my ears and mind around. Music as impenetrable as Joyce's Finnegan's Wake. (The French band Magma comes to mind. They were a progressive, jazz fusion symphonic rock band founded in 1969 by classically trained drummer Christian Vander, who claimed as his inspiration a “vision of humanity’s spiritual and ecological future” that profoundly disturbed him. One remarkable aspect of Magma's albums is that Vander actually invented a constructed language, Kobaïan, in which most of the lyrics were sung. I found the one LP I purchased so bizarre that no matter how hard I tried, I just couldn't fathom its appeal or appreciate its sensibilities. Interestingly though, in reading more about the band, I was pointed in the direction of music by Orff, Stravinsky and even Coltrane). My Magma purchase became a dorky running joke amongst my other music loving friends. 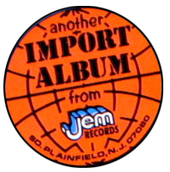 Still, there were other times where bringing home an import record was like discovering buried musical treasures that no one else seemed to have ever heard before. The cover art on import records tended to be far more wild and fantastic than any of my stateside recordings which mainly just featured pictures of the band. Sometimes, the cover art on an import album would even be different from its American counterpart, or the record itself would contain tracks not available on the domestic version. Buying an import album could be a real crap shoot. They were always more expensive and nearly every purchase was made flying blind without ever hearing the songs before shelling out the cash. I remember finding a double LP Virgin Records sampler once — long before Richard Branson was mainstream enough to establish an airline company with the same name — that had been incorrectly priced. Instead of $16 it was $6. And it contained a wonderful collection of odd musicians. Some of them filter back through my memory from time to time, and I smile when they do. I think I have slowly re-acquired nearly every song from those two slabs of vinyl over the years. Largely thanks to the internet. Some of those acquisitions will comprise my selections for the Happy Medium (Import) Song of the Day this week. Bear with me and you will be rewarded and, in some cases if you feel like reading, educated and entertained. 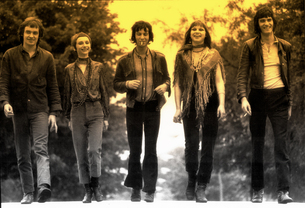 Our first dip into the Happy Medium (Import) Song of the Day comes from a collaboration between two strange and interesting bands: Slapp Happy and Henry Cow. I couldn’t even begin to recount both bands’ tangled history, antics, influences, and recordings so I’m just gonna point you to a very inclusive entry in Wickipedia to help with that: http://en.wikipedia.org/wiki/Henry_Cow. In the meantime, the song, “A Worm is at Work,” from the album Desperate Straights can be listened to here. It definitely shows off the “poppier” side of the two bands — if such an adjective can ever be assigned to them. It’s also, unlike most “import” tunes, short — and that will be part of my challenge throughout the rest of the week: keeping the file sizes small and still conveying a sense of these sometimes playful, sometimes difficult, always unconventional tunes that you may find as enticing as I did years ago… and still do today.